Bishop Pablo Virgilio David of Kalookan said a thorough investigation will be carried out, and even suggested the ashes used at San Roque Cathedral might have been purposely contaminated. “Rest assured that we will not leave a single stone unturned in order to find out what caused this unfortunate incident,” the prelate said to ucanews.com. Bishop David said several Massgoers reported feeling a burning sensation on their foreheads immediately after being marked. When the people washed the ashes off, rashes and blisters appeared on their skin. The ashes in question were not used after reports were received. Doctors who examined the rashes said a chemical substance caused the skin burns. The ashes were still being tested in a laboratory Feb. 16. 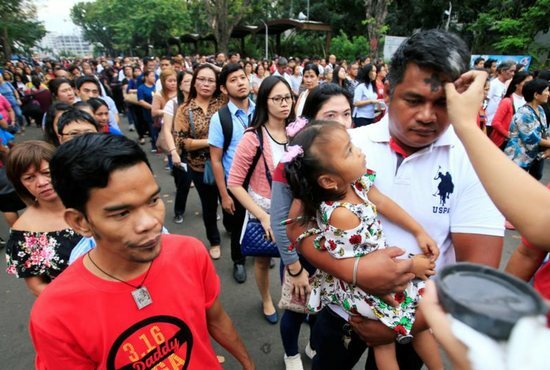 Bishop David said his office was still investigating whether staff had done something with the ashes, although they maintained they followed tradition in preparing them for distribution. “The fact that only some and not all the Massgoers seem to have been adversely affected by the ashes could only mean that only some specific containers contained the toxic substance, and not all of them,” the prelate said.